Road signs are almost as old as roads themselves. The first road signs in history consisted of markings on trees and rocks that were intended to guide cavemen through thick forests. Distance markers were brought about by the Romans, and intersections were not regularly signed until the Middle Ages. In this article we take a look at the history of road signs in Britain and at how they have evolved through the decades. 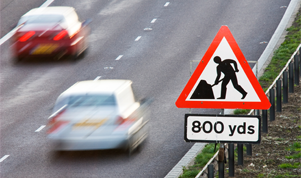 The history of road signs is closely linked to the invention of motor vehicles. Before cars began to ply the roads during the late eighteenth century, road signs were few and far between. Rather paradoxically, the first modern road signs in the UK were created by cycling associations, such as the National Cyclists Union, the Cyclists' Touring Club, and the Scottish Cyclists Union. Towards the early 1880s, these associations had put up cast iron boards along roads that were often used by cyclists. These boards acted as warnings, as they informed cyclists of common dangers that they were likely to encounter. Later on, these signs included other important information, such as the distance between towns or the right direction to commonly visited locations. During the nineteenth century, cycling associations also played an important role in the standardisation of mileposts and directional road signs, as they lobbied the government requesting changes in signage and road ownership. Despite the advances made in road signage as a result of the work of cycling associations, the invention of the motor vehicle was the most important factor in determining the history of road signs in the UK. The creation of motor vehicles brought an increase in the amount of traffic that used the British roads, and this in turn resulted in a need for road signs that pointed drivers in the right direction. Motoring began to be popular in 1896, and less than three years later specialised associations like the AA or the Royal Scottish Automobile Club began to implement their own road signage system for motor vehicle users. As in the case of the signs erected by cycling asssociations, these consisted of directional and warning signs. At the turn of the twentieth century, and following the rapid increase in the number of cars on the British roads, the government introduced the first forms of road legislation. The Motor Car Act of 1903 introduced penalties for reckless driving, made vehicle registration and possession of a license compulsory, and more importantly, increased road speed limits from 14 to 20 miles per hour. As a result of the new speed limits, road signs became a necessity. The implementation of the Act resulted in the creation of four standardised national signs, which pointed at restrictions, prohibitions, hazards, and speed limits. For the first time in the UK, the information contained in road signs could be determined by looking at the shape (and not at the text) of a sign. The shape-based system is still in place in our days. The number of road accidents increased year after year, despite the introduction of regulations by the Motor Car Act 1903 and the subsequent rise in road signs. This led to the implementation of the Road Traffic Act of 1930, which among other things, introduced the use of the Highway Code. This publication was intended to make car users aware of the meaning of road signs and markings and of their overall importance in road safety. In addition, the Road Traffic Act 1930 introduced speed limits for public transport vehicles and specific road signs that regulated their operation on the British roads. In 1934, new signs were introduced, along with the standardisation of the shape and size of all road signs, which was prescribed by the Road Traffic Acts and Regulations booklet. After Word War II, and particularly after the 1950s, the government began to make modifications to the road signs so that they would reflect the standards of other European countries. An example of this is the introduction of reflective signs during the 1960s. At the same time, motorways were being built all throughout the country, and with it came a need for a more developed road signage system. The Anderson Committee was set up in 1957 with the objective of designing new motorway signs that could be read by drivers travelling at high speeds. The major legislative reform affecting road signs in the UK was the one mandated by the Worboys Committee, which was created in 1964. This committee redesigned all road signs and ordered local authorities to implement a systematic replacement of old signs, which were deemed illegal. Within ten years, all road signs in the United Kingdom had undergone a radical change. Most of the current road signs date from this period.